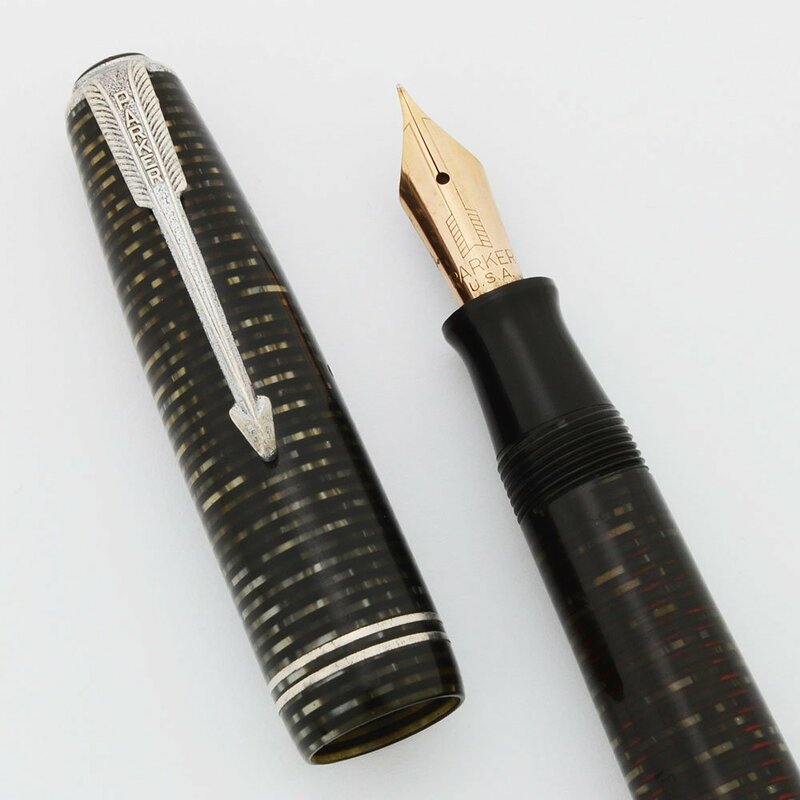 Parker Vacumatic Junior fountain pen from 1942. Restored Vac filling system, Pearl grey body with nickel plated trim, the split arrow clip, and two thin cap bands. 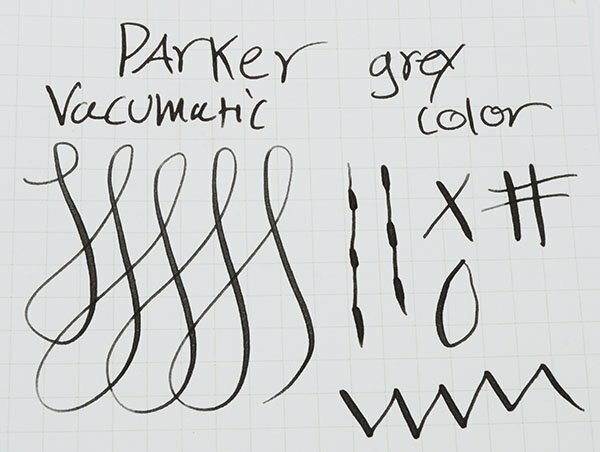 Gold Parker arrow nib is semi-flexible (marked "A" on the feed). Very nice condition, fully restored and working well. Type Vintage Vacumatic filling fountain pen. Product Name Vacumatic Junior. The Junior is more or less the same size as the Major, however it has two thin cap rings and a "split arrow" clip as opposed to the Blue Diamond clip. Manufacturer and Year Parker, made in USA -- 1942 (The date code on the barrel is a clear 2 with one dot). Filling System Later Vacumatic filling system. We have fully restored it with a new diaphragm and it's working perfectly. It has the plastic plunger. Color Grey, black, and amber striped finish. The trim is nickel plated to match the Grey Pearl and is the only Vacumatic to have nickel plated trim. The cap jewel is black. Thin double cap band and a split arrow clip. Nib Semi-Flexible fine gold arrow style Parker USA nib. It's smooth with nice tipping, and is fairly springy. It has an A on the feed. Line varies from fine to medium, so the flex is not dramatic. Please see writing sample. Condition Very nice condition. The pen looks shiny and the transparency is good. The coloration is quite dark. The cap and barrel have moderate scratch marks throughout, with bite marks on the top of the cap and at the end of the barrel. The section is also scratched. The trim and clip are dull from scratching and plating wear. The top jewel has a dent at the very tip. There are no cracks or personalization. The imprint is visible.